English keyboard music reached an unsurpassed level of sophistication in the late sixteenth and early seventeenth centuries as organists such as William Byrd and his students took a genre associated with domestic, amateur performance and treated it as seriously as vocal music. This book draws together important research on the music, its sources and the instruments on which it was played. There are two chapters on instruments: John Koster on the use of harpsichord during the period, and Dominic Gwynn on the construction of Tudor-style organs based on the surviving evidence we have for them. This leads to a section devoted to organ performance practice in a liturgical context, in which John Harper discusses what the use of organs pitched in F may imply about their use in alternation with vocal polyphony, and Magnus Williamson explores improvisational practice in the Tudor period. The next section is on sources and repertoire, beginning with Frauke Jürgensen and Rachelle Taylor’s chapter on Clarifica me Pater settings, which grows naturally out of the consideration of improvisation in the previous chapter. The next two contributions focus on two of the most important individual manuscript sources: Tihomir Popović challenges assumptions about My Ladye Nevells Booke by reflecting on what the manuscript can tell us about aristocratic culture, and David J. Smith provides a detailed study of the famous Fitzwilliam Virginal Book. The discussion then broadens out into Pieter Dirksen’s consideration of a wider selection of sources relating to John Bull, which in turn connects closely to David Leadbetter’s work on Gibbons, lute sources and questions of style. David J. Smith is Founding Professor of Music at Northumbria University, before which he served as Head of Music and Master of Chapel and Ceremonial Music at the University of Aberdeen. He specialises in early keyboard music from England and the Low Countries, and in English instrumental music more generally. As well as writing about the English keyboard music, its sources and instruments, he has edited the keyboard music of Peter Philips (1560/61–1628) for the scholarly series, Musica Britannica, and more recently contributed an edition of consort music by Philips and Richard Dering (c.1580–1630) to the same series, some of which has been recorded by the Rose Consort of Viols. 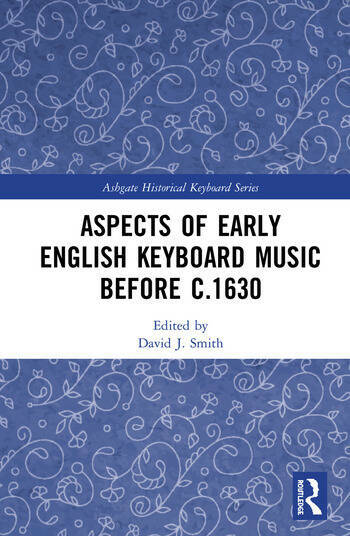 David is co-founder and General Editor of the Ashgate Historical Keyboard Series.